That doesn’t mean I’m put together enough to have a Resolution. I like and respect resolutions, but they’ve never been for me. I am not one who can become a better person simply by constantly thinking about being a better person. I do, however, always set a “goal,” which I acknowledge sounds like a euphemism for “resolution,” but that’s not the way I interpret it. The goal is always a little fun—a regular activity that exercises my mind or body, or a small thing I can do to make my days brighter. At the heart of it, it’s a things I can’t fail at. I can’t punish myself for not accomplishing it. I can’t use it to dwell on a supposed inadequacy, the dangerous part of resolution-setting I think. Goals are better for me because I’m someone who likes adventure but often cleaves to the warmth of routine, especially in January, the winter, when the word “renewal” seems out of place. I think that’s typical of editors. Maybe I’ll push the adventure envelope a little. The gravitas of that five is making me think I will. And maybe I’ll just keep on living my days as I do. Either way, I can’t lose. As for food, I typically eat in a way that’s right for me and cringe at the undertones of self-doubt, classism, and self-punnishment in some of the January media. But I applaud those that use The First to change something they don’t like about what does or doesn’t go into their bodies. Diet aside, I do resolve not to complain so profusely (out loud, at least) to anyone who will listen about my ennui about the mid-winter produce that’s available locally. So at the very least, I will seem less smug in 2015, and that’s certainly a good thing. 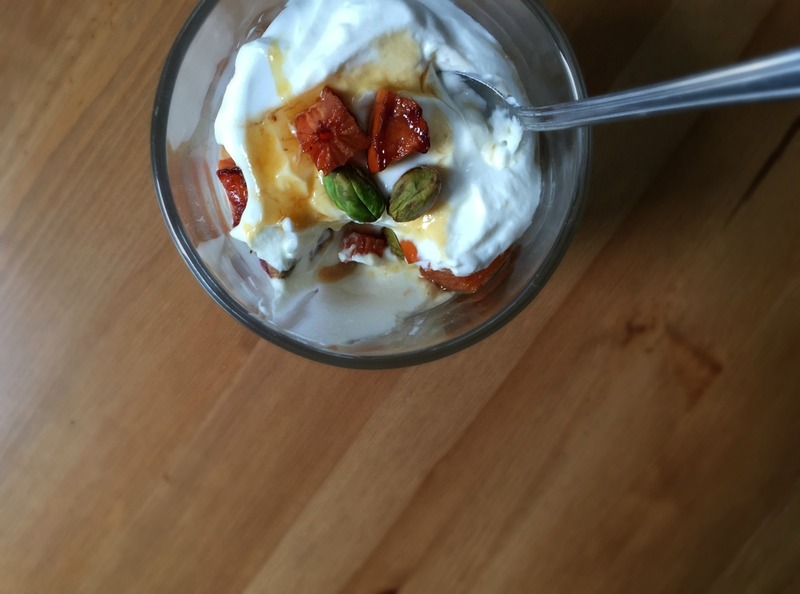 Persimmon is a winter fruit that I don’t typically crave—the fuyu variety, which you can eat right away without waiting for its astringency to ripen away, is floral and lovely but too honey-sweet for me to enjoy as a regular ingredient or fruit. So their sunny orange color doesn’t subdue that mid-winter ennui for me, and I can count the times I’ve bought persimmons on one hand, most likely because I was turned off by the terrible persimmon- ginger tarte tatin with honey caramel that I made and thought was a good idea. It wasn’t. But I do quite enjoy them roasted. While we roast to caramelize and bring out sweetness, the persimmons do not become sickly sweet through this method. Instead, their walls tighten and their flavor becomes so much more complex that, to me, their sweetness is obscured by how delicious they are. Olive oil, salt, and pepper give them savor and spice and a dash of cinnamon makes them, in a weird way, taste like little nuggets of fruity French toast. A honey, cooked until a burnt caramel, gets a shot of lemon juice, and when eaten in the parfait, it gives those French toast nuggets a nice element of bitterness and acidity. 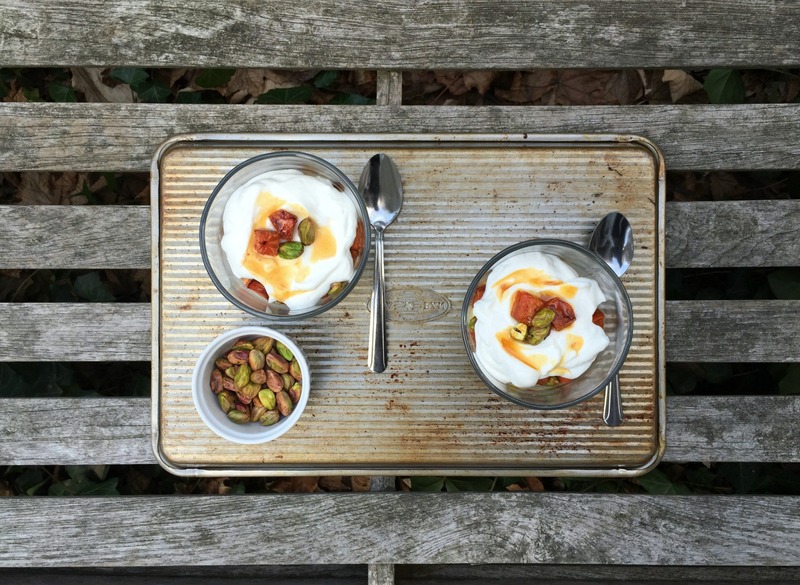 Pistachios go nicely with persimmon and add crunch to the parfaits, so there’s no granola needed. I’d eat this, still, as dessert, but for people who can tolerate a little sweet in the morning, it could be breakfast too. 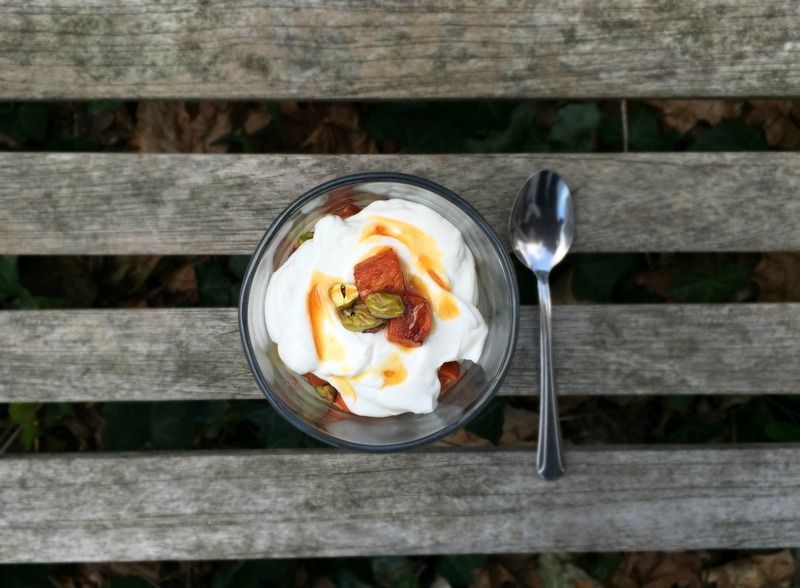 Serve it layered or just top a bowl of yogurt with the fruit, nuts, and honey. I’m not sure I would call eating persimmons adventurous, the dish isn’t low-cal for people who care about that (but it is healthful, which is what I care about! ), and this post isn’t particularly different from those past, but I’m excited to see how life evolves this year and prepared if it stays stationary. To 2015! Adjust oven rack to middle position and heat oven to 375 degrees. Transfer persimmon to rimmed baking sheet (a smaller jelly roll size pan is best) and toss with enough olive oil to coat, salt to taste, a couple of dashes of cinnamon, and a pinch of pepper. Spread out persimmon and roast until caramelized, 20 to 30 minutes, tossing persimmon halfway through roasting; set aside. Heat honey in small saucepan over medium-high heat until bubbling. Reduce heat to medium-low and cook until deepened in color, reduced, and honey smells toasty, about 15 minutes. Off heat, stir in lemon juice. Keep honey covered over low heat to keep pourable. Meanwhile, place yogurt in bowl of stand mixer fitted with whisk attachment and whip on medium-high speed for 2 minutes to lighten (or use a bowl and hand mixer). 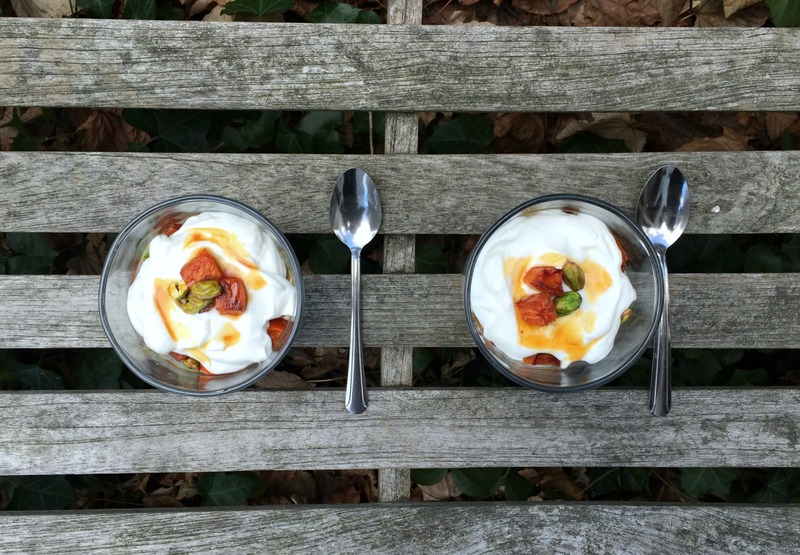 Layer serving dishes as desired with yogurt, roasted persimmon, pistachios, and light drizzles of honey. I like the idea of saying “goals” instead of resolutions. Like you, I’m a creature of habit, but I also love the hope and promise of a new year. 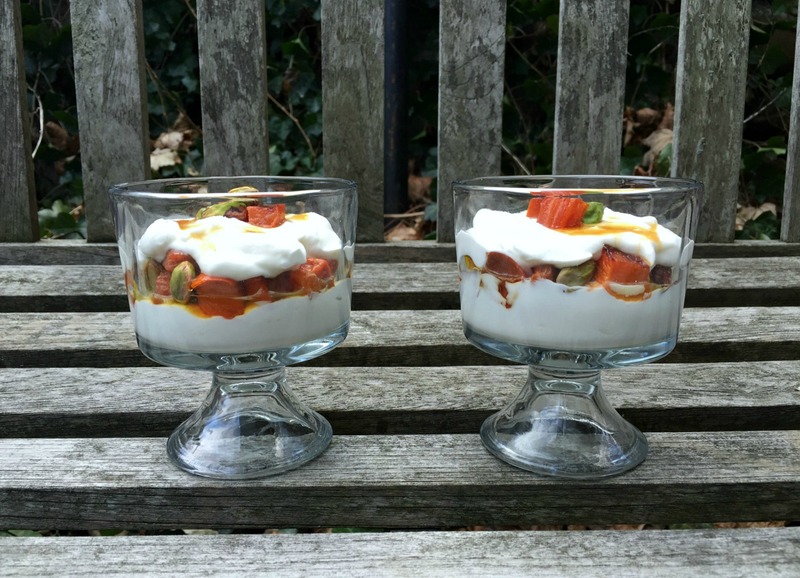 I haven’t had persimmons in years and I’m totally craving a bowl of this parfait! I loathe resolutions. Especially the ones that everybody feels compelled to announce this time of year. Why set yourself up to fail? But I do resolve this: I will try something with persimmons this year. And this looks perfect. i echo thoughts…. there are only goals and intentions that i look forward to pursuing each year. not a diet or “lifestyle” change, or drastic examination. it just feels like a deep breath and fresh thoughts to me. i will eat for my health, and eat for my happiness, because that’s what nourishment is all about. I tried my very first persimmon this year, and it was only a very little bit of a ripe, raw one. They’re always intimidated me so much! Now I feel a bit more educated, and ready to tackle a recipe with them soon. Thanks for that!